For forty-five years an unsung American war hero who should be a legend within his own country has done what a good soldier does and kept his mission secret. Now his country is calling upon him again. A dying creature is on a killing rampage in the North American woods and holds a threat far greater to all mankind. The U.S. government has called upon this legendary figure to stop it. It’s up to the man who killed Hitler to now kill the Bigfoot. One of the greatest titles in cinematic history is everything it says it is and a whole lot more. Writer, director Robert D. Krzykowski has an eye popping title that is sure to get attention but the true tale inside this movie is a reminiscent end of days love story that’s more dramatic than it is gratuitous. The title will definitely get viewers; I just hope it finds the right audience who’s ready for a serious character driven performance. A man who’s lived his life feeling like a monster because he killed a monster among men is asked to track and kill an actual monster. Sam Elliott is simply amazing in a rare film of his that lets him show emotion in a range of forlorn lover, troubled veteran, and an American legend. 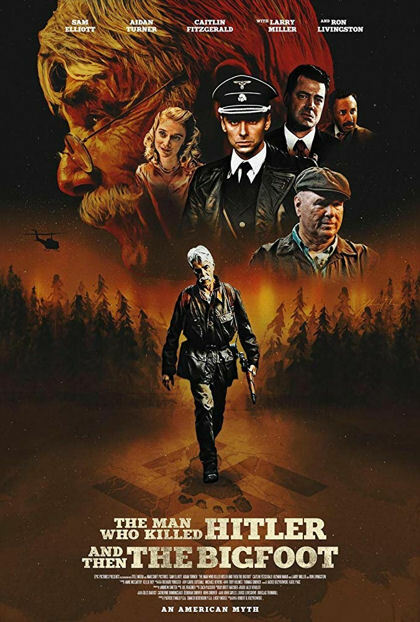 This movie isn’t actually built around The Bigfoot or Hitler, it’s built on Sam Elliott’s performance and he shines grimly as the highlight of the film. Not all is glorious in the land of Hitler and The Bigfoot. Aiden Turner gives an excellent performance but Sam Elliott is such a unique individual with his look and voice, there is a disconnect between the younger and older versions of Calvin Barr. The Bigfoot costume itself was nicely different but also left a little something to be desired. Just as unexpected as this title is to such a dramatic movie, scene to scene editing also isn’t what you’d expect and at times is off-putting. If any fans are looking to see some Syfy concoction of multi-headed animals, this isn’t the film you’re looking for even based on the title. What this movie does isn’t what you think but what is does do, it does well. This is a movie a husband and wife can enjoy together. It has romance deeper than romantic films, it has character, it has drama, it has action, it has Sam Elliott The Man Who Killed Hitler and then The Bigfoot.